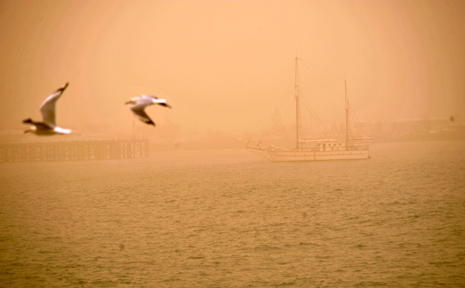 A yacht sailing into Coffs Harbour Jetty about 9am this morning can barely be seen through the thick dust. DUST engulfing the Coffs Coast is having much the same impact right along the eastern seaboard. It is expected to clear by mid-afternoon. Coffs Harbour airport was re-opened at 10.30am after poor visibility and strong winds in the region forced its closure earlier. 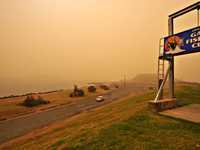 Motorists traversing the Pacific Highway north and south of Coffs Harbour have exercised extreme caution and no accidents have been reported as a result of the dust. The orange haze covering much of NSW is caused by the same scattering process that normally makes the sky blue. 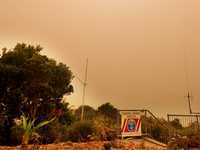 University of Sydney physicist Tony Monger says dust storms were common decades ago but have been relegated more to rural parts of the state in recent times. 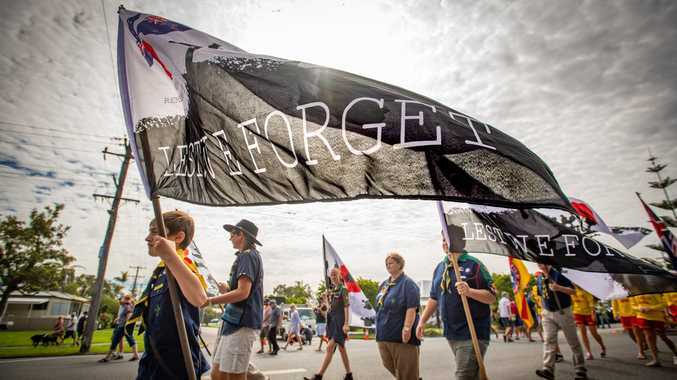 “If you live out in the country you see this all the time,” Dr Monger told AAP. 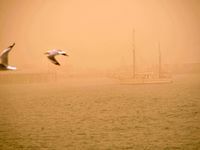 Dust storms that hit parts of NSW on Tuesday arrived in Sydney on Wednesday just before dawn, turning the sky to a deep orange. Dr Monger, who studies atmospheric optics, says the same process that keeps the sky blue has contributed to the change in its hue. “When astronauts look down at the earth and they see a blue earth and when we look up and see a blue sky it’s because there’s blue light being scattered around all over the place by the air molecules,” he said. "Sunlight is a mixture of colours from blue to red, but it is the blue that is predominately scattered across the sky," Dr Monger said. 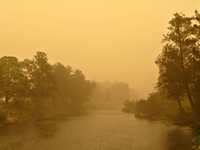 “When the atmosphere is suddenly swamped with a whole bunch of particles, which are other than just air, like lots of dust and aerosols, then they scatter light differently,” Dr Monger said. The dust particles are rich in iron, which gives them a reddish colour and is reflected across the sky when bombarded with light.